Performance starts at 7pm. No need to book tickets, just turn up! 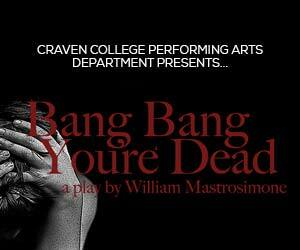 William Mastrosimone wrote the play “Bang Bang You’re Dead”, to address school violence. Based on a true story and written in reaction to threats of violence-from students, toward students-at his son’s school. The play is about a teenage boy who has shot and killed five of his classmates. He is sitting in a cell and the ghosts of his victims come back to question why he did what he did.